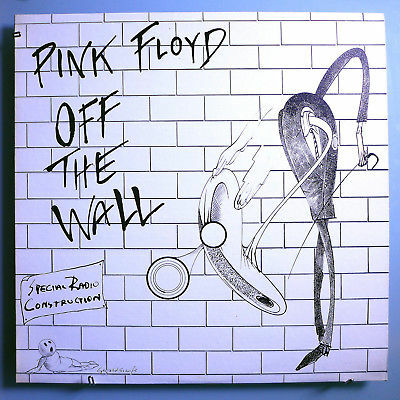 Pink Floyd – Off The Wall is a rare 1979 US eight track, radio-friendly white-label promo sampler LP for The Wall album that was distributed mainly to radio stations in 1979 and the early 80’s. The album featured extended versions of several tracks, along with clean intros and outros. Rather than blend track-to-track, the album was banded with gaps between the tracks. A shorter running time allowed the vinyl to to be mastered with deeper-cut grooves for better sound quality. Among the cool stuff contained in this sampler’s eight tracks were a longer version of “Run Like Hell” with a clean opening and cold fade without crowd noises, a version of “Young Lust with a clean outro without the phone call dialog on top of it, and a version of “Goodbye Blue Sky” that had a clean intro with no sound effects. One of the FM stations I worked at in Los Angeles back in the day had a copy of this beauty. Currently, it is one of the better Pink Floyd vinyl rarities out there. Expect to spend $$$$ when you find one, as you just did, right here and now (consider yourself lucky!). Another Brick In The Wall Part 2 — The “hit.” Nothing special here. This version lacked the 9-second extended instrumental intro of the single version. It had the same ending as the single version — a fade out towards the end of David Gilmour’s guitar solo. Goodbye Blue Sky — It lacked the pastoral sound effects at the beginning of the track. The acoustic guitar intro was clean for about the first 9 seconds. On the album/CD version, sound effects of birds and bomber fleets could be heard until the synths kicked in. The outro was a wash. On this LP, the song faded out completely at the same spot in the music where we would have heard the first notes of “Empty Spaces” on the CD. Young Lust — The track started with the same the pickup beat and went straight into the vocal as the album/CD release. It clocked in at 3:25 on this release. Basically, it was the same running time as the original LP version, but the pick-up note at the beginning lacked the crossover from “Empty Spaces” and the outro was clean, lacking the dialog of phone call back home on top of the music. One Of My Turns — A clean version of the track with nothing obscuring the beginning or the the end. The opening synth was unobscured and had a faster attack that faded in quicker. The first 6 seconds of the track was clean and lacked the dial tone sound effects of the album version. At the end of the track, the echo and reverb of Roger Waters’ vocal “Why are you running away…?” sustained for about 3 seconds longer than the album version. Hey You — No different than the album version. The vocal echo of “…we fall” faded out just before the opening sound effects would have started on the album version of “Nobody Home”. Nobody Home — No different than the album version. Comfortably Numb — No different than the album version. Run Like Hell — This extended album version of “Run Like Hell” had a clean opening and cold fade without crowd noises. This version had the complete, extended 8-bar intro with additional guitar “flair.” The outro was extended and had the full guitar refrain which repeated twice (instead of once) for the full 16 bars. All songs written and composed by Roger Waters, except where noted.